What’s your most important piece of hunting equipment? Rifle, ammo, knife, hunting pack? Nope, it’s your boots; while that other gear will certainly make your hunt more successful, without a good pair of boots, you won’t get very far from your vehicle. If your feet are hot, wet, cold, cramped, sore, blistered, or suffering from a bad case of snakebite, it’s going to be nearly impossible to focus on anything else. The best boots for hunting may not be a hot top of discussion or a frequent point of one-upmanship, but it’s something that will make or break your outing. All hunters need a pair of boots, but not all hunters need the same pair. Choosing the correct ones for you can be a struggle, and it involves careful consideration of the terrain you’ll be traversing and the time of year you’ll be doing it, like choosing the correct hunting camo for the area of your hunt. These hunting boot reviews will help you find the best pair for your specific needs. Bottom Line: The Vaprtreks are some of the best boots you could use on an early-season hunt. They’re lightweight, sufficiently waterproof, and incredibly comfortable. Just from looking at the boot, you’ll notice that they provide some serious protection for your feet. The 7-inch-high shaft is just enough to keep your ankles from rolling on a misstep, and the larger-than-average toe cap and strong arch support will make these some of the most comfortable boots you own. While these are considered an early season boot, they do come with 400 grams of PrimaLoft insulation. That’s not going to be enough for below-zero temperatures, but it will keep your toes warm in chilly autumn weather. Irish Setter’s “ScentBan” technology is designed to prevent bacterial growth that might put off odors your target would be able to detect. The technology is integrated into all parts of the boot, from the footbed to the outer linings. The Vaprtreks are a great pair to have for early-season hunts that have you moving around a lot. They’re also a good choice for shed hunting, where the temperatures will be warmer and you might need to traverse rough terrain to find the antlers you’re looking for. Bottom Line: The Bugaboot is a good choice for hunters looking for a budget option. They are quite warm and comfortable enough for all day wear, they’re the best boots you’re going to find at such a low price. With moderate use, they will last a few years, and in that time they’ll do their job well. Columbia’s Bugaboots might be some of the better budget boots currently on the market. They’re quite warm, even though they only have 200 grams of insulation, and are able to accomplish this feat with their patented Omni-Heat liner. That’s the same material used in the liners of Columbia’s coats; it reflects heat like a space blanket and prevents it from escaping the boot liner. The materials used in the Bugaboot are top of the line, including full-grain leather and waterproof sealed seams. Since they don’t have as much insulation as other cold weather boots, they’re also surprisingly breathable. 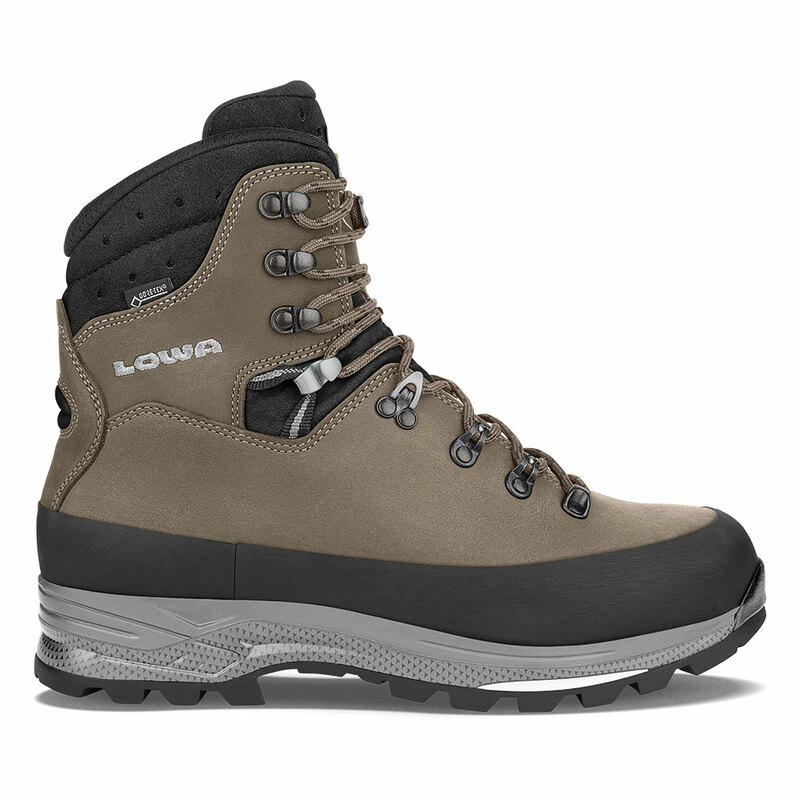 The outsole is relatively thick compared to some of the other boots on this list; you shouldn’t expect too much flexibility, which means they’ll perform better on longer hikes with a heavy pack. One issue with these boots is that it seems that the stitching doesn’t hold up that well over time. This pair of boots probably won’t stand up for years of abuse, but they’re pretty great while they last. Bottom Line: ​Lowa’s Tibet GTXs just might be the best hunting boots for anyone needing to carry a heavy load. They’re still comfortable after hiking a dozen miles or so with a 50 lb. pack, and they’re some of the most durable boots on this list. Usually, boots that are fully constructed of leather and Gore-Tex, with no ventilation, lead to a lot of sweating. It’s an awful choice hunters have to make: do you want your feet to be soaked in sweat, or do you want them to be soaked after walking through wet brush or fording a creek? Either way, you lose. Somehow, the Tibet GTXs have retained breathability while also being impervious to water when fully submerged. One of features that most impresses hunters is the lacing system on these boots. There’s a stud on the tongue that the laces move through on each pass. This little addition keeps the boots tighter throughout the day, as the laces are tightened on each eyelet instead of just at the end. It also allows you to customize the lacing pattern to your foot - looser in areas that are painful for you and tighter in spots that usually rub. These are an all-around, fantastic pair of boots. Their one downside is cost. But boots that are this warm, waterproof, and durable but still breathable are going to cost you. They’re everything you need in a great late-season hunting boot; treat them well, and they’ll last for many years. The majority of hunting boots fall into the category of mountain boots, which are designed to be comfortable for walking long distances. They often have a leather or Gore-Tex upper (the portion of the boot above the sole) that’s breathable enough to release heat and humidity from your feet. They’re usually tougher than hiking boots and better suited to the rigors of occasional off-trail hiking. Mountain boots may also be insulated to protect against cold temperatures later in the season. This small company in Bozeman, Montana has been producing some of the best hunting boots for more than a decade. The Mountain Extremes are just the latest in their long line of successes. The boots’ uppers utilize a one-piece construction, meaning there’s no gap between the boot tongue and the rest of the upper. This, in addition to the 2.8mm full-grain leather used, makes them incredibly waterproof. They also have a 7mm midsole, which provides great support on rough trails. While the Mountain Extremes might look a bit clunky, once you try them on, you’ll see they’re pretty lightweight for their size (3.9 lbs). They’re also formfitting and super comfortable due to the padded collars at the top. Since these boots are not insulated, they’re best for use during the fall and spring. If you’re going to be out during the winter, choose a different model from Kenetrek – you won’t be disappointed. Consider their 400g and 1000g Thinsulate versions, the latter of which will keep your feet warm in all but the coldest of temperatures. Kenetrek’s boots are top-quality, and have a price tag to match. A pricey boot for sure, but your feet are a worthwhile investment. Most hunting boots are at least a little bit clunky. They’re usually insulated, have thick rubber outsoles, and are meant to stand up to a lot of abuse. Unfortunately, that means they’re also not the most pleasant to walk in, with their weight making every step require a little more effort. Under Armour’s Speed Freek boot subverts that stereotype with this light, uninsulated boot that’s still durable enough to stand up to the rigors of hunting. Built more like a hiking boot, the Speed Freeks utilize thin leather and Gore-Tex lining to keep them very breathable and lightweight. They’re rated to 55 degrees, which means you won’t be able to use them during the winter or anywhere that has chilly autumns. However, you should keep in mind that these boots are designed for hunters who are on the move, meaning their feet will naturally be warmer. The boots come equipped with the company’s signature “Scent Control” technology; if there’s one thing Under Armour knows how to do, it’s how to prevent your clothes (and shoes) from stinking. The material is designed to halt the growth of the odorous bacteria that are present in sweat. But even without Scent Control, the Speed Freeks still don’t get much of a smell, due to their excellent ventilation that limits sweating in the first place. The Speed Freek Bozeman from Under Armour is a great boot for early-season hunters, particularly bow hunters who do a lot of stalking to reach their target. They’re incredibly comfortable and very breathable. Even if you need something warmer for later in the season, this is a great pair to have in your closet. While most hunting boots are water-resistant, truly waterproof models are typically made of vulcanized rubber. This creates an impermeable barrier between your feet and the wet environment. Rubber boots also have the advantage of not holding onto your scent. Waterproof boots are a necessity if you’re crossing a lot of creeks or a big marsh, though they will lead to overheating if you’re doing a lot of hiking during your hunts, especially in warmer climates. These knee-high boots from Lacrosse are the perfect choice for hunters making their way through the swamplands or crossing numerous creeks. Constructed of rubber and polyurethane coated neoprene, they’re tough as nails and won’t be punctured by thorns if you need to trudge through heavy brush. At the same time, they’re lightweight and really comfortable – two things that are often lacking in rubber boots. One of the biggest problems with waterproof boots is that they often seem like they weren’t designed for walking in. With many models, your feet slip around and the soles are too stiff, making longer hikes unbearable. The Aerohead has none of these issues, with an upper that fits your foot snugly; actually, the boots flex enough that they don’t feel much different than a mountain boot. With 7mm of rubber and neoprene, they’ll keep your feet dry and toasty in pretty cold conditions. If you need them in warmer weather, there’s a 3.5mm model as well. They’re also reasonably priced for the 7mm version. MuckBoots is a leader in the waterproof boots category, and their Woody Sports are one of the best early- to mid-season boots you can buy. Their most noticeable feature is how pleasant they are to walk in, mostly thanks to reinforcement in the Achilles heel and toe regions that are prone to slippage in other boots. The extra material keeps your feet snug and prevents blisters on longer treks. This is a great pair of boots to have for when it’s moderately cold outside. MuckBoots claims they’re rated to -20 degrees F, though you’ll want to be cautious about wearing them in extremely cold weather. Your feet will stay warm so long as you’re moving, but sit down for an hour or so, and your toes will be freezing if the temperatures are much below zero. Some hunters have complained that the collar of the boot is a little too tight and doesn’t allow them to tuck their pants into it. This is true, and is a design feature to enhance insulation. That being said, you’ll want to wear taller socks to prevent the collar from chaffing against your leg. The Woody Sports are a great choice for hunters who need a pair of comfortable waterproof boots, but don’t need them to especially warm. Those using a tree stand might find their toes getting cold after a couple hours, but you can’t beat them for autumn hunts. This last option is great for anyone hunting in snake country, where tall grass and rock piles can hide some nasty creatures. Snake boots are a necessity in these areas, and they’ll give you peace of mind so you can focus on the hunt instead of worrying about what might attack you. They’re built with thick uppers that extend further up the calf to prevent any creature’s fangs from sinking into your flesh. When you’re hunting where rattlesnakes roam, these are the boots you’ll want on your feet. There’s 15.5 inches of snake protection between the sole and the top of the boot. Sandwiched in between the inner Gore-Tex liner and the full-grain leather upper is a flexible yet impenetrable layer of snake protection, which extends around your calf and ankle. In addition to their superior snake protection, the Pronghorns are just downright comfortable. Danner’s “Terra Platform,” a combination of aggressive treads on the outsole, extra cushioning on the midsole, a wide platform, and a thick shank to protect your feet from sharp rocks, makes them a great choice for longer outings. While snake boots can be a pain to take on and off, the Pronghorns have a zipper on the side that makes them a cinch to remove. They’re also really easy to tighten with the Speed Lace system, requiring just one pull instead of the laborious task of redoing the whole thing to get a uniform fit. The price is reasonable for boots of this quality, and a far better way to spend your money than a trip to the ER for antivenin. Most snakeproof boots use thick leather to stop a snake’s fangs from penetrating into your flesh, but leather’s not the only material that can do this. MuckBoots, famous for their line of waterproof hunting boots, uses thick rubber to stop a snake’s bite. Some people might be skeptical that they can provide as much protection as their leather counterparts, but rest assured, nothing’s getting through these boots. One advantage to using a rubber and neoprene design for snake boots is that they’ll also keep your feet much drier than leather versions. The Pursuits come with 4mm of neoprene in addition to the rubber outer layer, which work together to prevent any moisture from getting in. However, this also prevents any moisture from getting out, which is why the boots have a fabric lining that will wick sweat away from your feet. It should be noted that these boots are not insulated and are only recommended for early-season hunts. They’re rated to 40 degrees; below that, your toes will start to get chilly. The MuckBoots Pursuit is a great pair of boots for anyone hunting in snake country who also wants to keep their feet dry. They’re more suited to swampy conditions than hot, dry ones, though. They’re a good budget option that will provide comfort throughout the early part of the season or in warmer climates. There is no piece of equipment more critical than a good pair of boots. The importance of boots is often overlooked because their features aren’t particularly interesting – thick leather uppers, a few more millimeters of midsole support, enhanced waterproofing. Not the type of things most people brag about; then again, you’ll have absolutely nothing to brag about if you end your day early because your feet are covered in blisters. Choosing the best boots for hunting will make the experience more fun, safer, and more likely to be successful. Your feet will thank you for it. Don’t forget that most boots have a break-in period of at least 20 miles. Do not use them for an extended hike until they’ve been broken in, and bring some moleskin while you do it. So how about a good waterproof, insulated hunting boot for guys with 4E wide feet.